Awesome news for fans of Scott Snyder and Rafael Albuquerque’s American Vampire (which is currently on hiatus)! 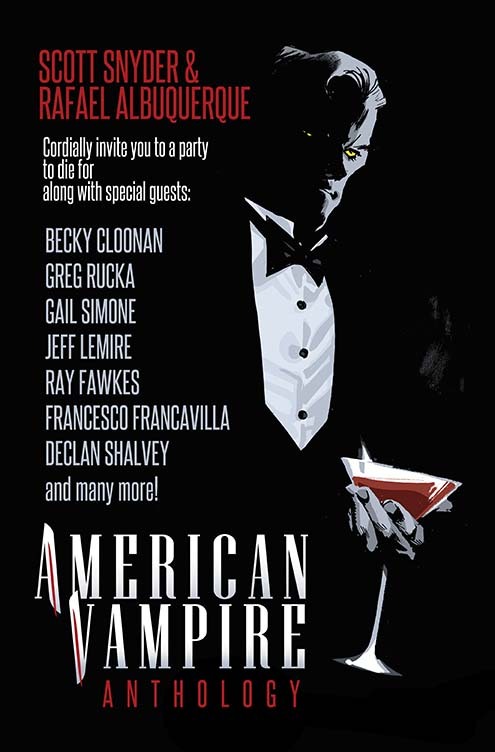 Vertigo Comics plans to release “American Vampire Anthology” August 7, an 80-page anthology issue featuring American Vampire universe stories by big names like Greg Rucka, Gail Simone, Becky Cloonan, Jeff Lemire, Ray Fawkes, Francesco Francavilla, Declan Shalvey, Gabriel Ba and Fabio Moon and more. Kickass! Anthology will follow the release of American Vampire: The Long Road to Hell, co-written by Snyder and Albuquerque with art by Albuquerque, which stars fan-favorite vampire hunter Travis Kidd and debuts June 12. American Vampire Anthology #1 hits stores August 7. Who here is planning on picking it up? I’ve been a fan of the comic since before its release (yay ARCs! ), so I’ll be picking up a copy of this anthology for sure. Why So Few Good Vampire Comedies?